Join us in our commitment to turn childhood dreams into reality by supporting THONTM. Together, Justin Gorsuch and Justin Alboum, are taking action by uniting with 16,500 student volunteers and over 25,000 alumni supporters in the fight against childhood cancer. Our year-long efforts culminate in a 46-hour, no-sitting, no-sleeping dance marathon each February to celebrate our survivors, remember those we’ve lost, and take a stand--all in hopes of one day dancing in celebration of a cure. Hi we are the Justin's, we have been best friends for the past 4 years and have always been passionate about Thon. From our first time standing in the stands during our freshman year, we knew that we wanted to dance together for our senior year. In the past four years we have spent countless hours participating in canvassing trips for our fraternity Phi Kappa Theta, ran in every Thon 5K event, and have stood 40+ hours in the stands each year. It would mean the world for us to have this experience and take part in what we believe is the best event Penn State has to offer. Any donation would make a huge difference to those families affected by pediatric cancer's lives and bring us one step closer to achieving our goal. 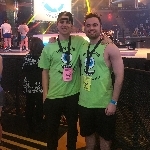 Justin Gorsuch and Justin Alboum have been working tirelessly all year with the hopes of being selected to dance in THON 2019. Independent Dancer Couples are dedicated individuals who set up their own fundraisers throughout the year, and with the support of friends and family, will obtain tickets in a lottery system in the hopes of earning a spot as dancers in the Penn State Dance Marathon. 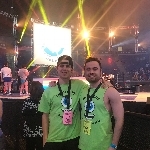 With your contribution, you will bring Justin Gorsuch and Justin Alboum one step closer to being able to take a stand against childhood cancer during THON Weekend 2019.